Tactical portable FRA1530M antenna designed for multi frequency medium range communication. For installation as flat top, inverted"V" or sloper.Easy to install by one person. Construction for any climate use. The antenna wire consist of a multi-wired copper cable for long life operation as well as being adapted for maximum performance. Stainless steel antenna wire on request. The total width of antenna is 30 meters. transmitters for all type of radiocommunication, including so called "frequency-jumps" operation. The solid weather-proof construction and design makes it able to meet strict demands. The antenna is easy to assemble and can be done by one person. Balun transformer is fitted into bottom of central rod in order to completely SO239 connector. 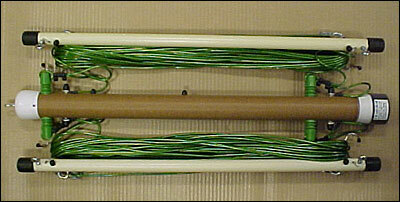 The end connection bars are fitted with hooks which can be used as a reel for the antenna wire under transportation. The antenna take little place under transportation. Easy to handle, which allows for install of antenna to be quickly ready for use. The antenna`s keys performance and other parameters show that each antenna is more or less dependent on the natural earth resistance at every new point of installation including electrical and geodetic physical characters. The antenna gives also the advantage of EMI rejecton greater than conventional dipole and other antennas on different frequencies. The antenna-system`s parameters means that VSWR and efficiency remain within approved limits. No antenna tuner required. The SWR measurement may in reality vary in according to natural resistance, the installation or set-up of the antenna and geodetic position.